Recipes made with whole grains, beans, vegetables and fruits are not only delicious, but help you maintain healthy elimination. This is a guide about high fiber recipes. I am looking for high fiber recipes. Thanks. Yams and sweet potatoes have a good fibre content! I usually cut them up, boil them and add a little margarine and brown sugar to them and eat! makes a yummy snack or side dish. Cooked spinach also has fibre, I like to fry it up with an onion, salt and pepper. Get some ground flaxseed. Add it to hot cereal, dry cereal, yougurt, in recipes. A serving is 1 or 1 1/2 tbsps, I have read both amounts. Since I have been using it, I have had no problems with my elimination problems. I use Benefiber in our orange juice; adding it to the water before I add the frozen concentrate. It stirs in and dissolves completely, has no color and no taste. I use 3 Tablespoons in a large can of juice. We also snack on these home made Banana Bars. Note: Konsyl is a sugar free 100% Psyllium Fiber product available at the pharmacy. 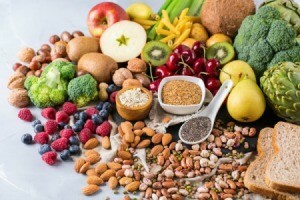 This is added because most people do not get enough fiber in their diet. Stir the liquids into the dry mixture thoroughly, making sure they are all moistened. Spray a 9X13 pan with a non-stick spray, and spread the dough evenly in the pan. Bake for 25-30 minutes at 350 degrees F. Cool and cut in squares. To get the health benefits, be sure to use Whole Wheat Flour (preferably Stone Ground), and the Konsyl. Do not substitute or omit these ingredients. Buy whole wheat pasta and have brown rice at all times. Not only is it higher in fiber, but it's much healthier for you and has a low GI index. Find some bulgur wheat and use it instead of rice or cous cous in recipes. Or, add it to your rice or cous cous. It's got a ridiculous amount of fiber and also lots of protein. Peanut butter is also high in fiber. If you can find it in your local grocery store, there's a cereal called Fiber One which also has tons of fiber in it. You also might want to check out Brenda Watson products. She was on PBS promoting FIBER 35. Hubby and I enjoy salmon or mackerel patties. Once when we ran out of saltine crackers just before payday, we used some bran cereal we had on hand instead of the crackers to make them. They were delicious! I'm guessing you could substitute any bran cereal (such as All-bran) in any recipe that calls for crumbled crackers or corn flakes. You'll add flavor as well as fiber. I keep several foods on hand to increase my fiber intake--avocados, chick peas, fiber one cereal, Fiber one granola bars, if I'm on the go (they taste great), dried figs and apricots and flax seeds or flax seed bran to add to just about anything and popcorn. Pretty painless and I like all these foods. I am looking for some high fiber recipes. I need to switch to a high fiber diet. Does anyone have any tips or recipes to share? I had to go on a High Fiber Diet to help me lose weight about 10 years ago. I have menus, grocery lists and recipes to share if you want me to send them to you like in a weekly email. It is also low fat. 8 years ago I was diagnosed with Type 2 Diabetes and this diet along with Weight Watchers helped me lose from 300 lbs to 180 lbs. Not sure where AZ is (I'm assuming it is in the USA as you spell 'fibre' differently there), but in Australia, we have access to high-fibre milk and bread. I love these products! Otherwise, I would recommend getting a book from the library or a shop which details fibre contents of foods - legumes and beans are highly recommended, plus powdered fibre such as Metamucil (if you have it wherever you're from) from psyllium seeds to stir into drinks. Good luck with that!